Re-Learning To Teach: Day 26: IMPROVE YO'SELF! I was very disappointed with the scores on the pre-algebra quizzes yesterday. I knew the students would be as well since they seem to know what's going on in class. I don't want them to get discouraged and give up on the class, so I decided to let them revise. "These tests were pretty terrible, which I find confusing since you guys clearly know what you're doing! We've been talking about this stuff for 2 weeks now and everything you've done in class has been quote good. So, here's my deal: show me what you know and I'll acknowledge, in grades, that you know it. But I need you to also think about what happened on this quiz." "Mr. Aion, can I just keep this grade?" "Unless it's 100%, there is room for improvement. I want to see you improve." I was very impressed by the effort in 1st period. Students formed groups and worked together, asking good questions of each other and thinking that they were cheating by dividing up the work, but I know the truth: They were teaching each other. In geometry, I lead a number talk, apparently. I had a mild argument with a friend on Facebook about the "Common Core problems" that her son is working on and frustrated by. I plan to write a longer post about this, but in short, the purpose of Common Core is to help students think about numbers. All too often, the methods that we teach our students are VERY different from the ways that they think about numbers on their own. So I asked them. "I'm going to put a problem on the board. If when you have a strategy for solving it mentally, I want you to put your fist to your chest. I don't want anyone to call out the answer, but be ready to explain your strategy." 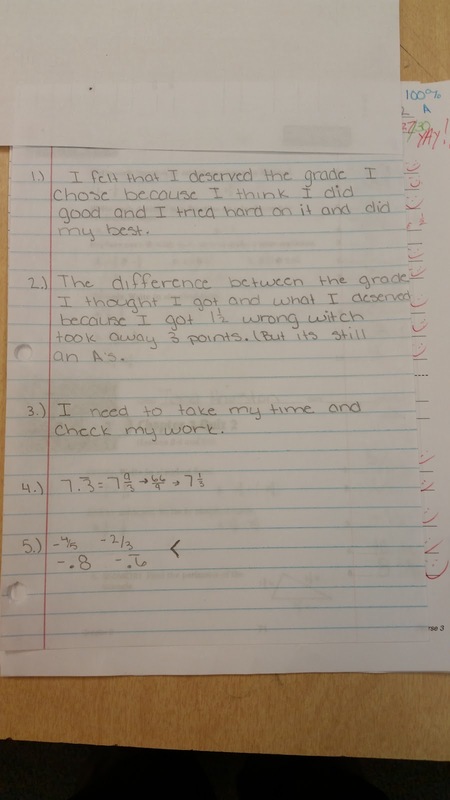 I put a series of simple problems and asked the students to explain their strategies. I wrote their strategies on the board and asked the rest of the class if they understood. Only 1 or 2 seemed counter-intuitive, but after explanations, they were quite clear. We had a nice discussion about the importance of "thinking about numbers in many ways." I was VERY impressed with the reasoning that they demonstrated and the ensuing discussion about multiple methods for problem solving versus using a "standard algorithm." Even the students from yesterday who have expressed their desire to focus on "the way to do it" agreed that there were many multiple ways to solve problems and to think about numbers. It wasn't a huge win, but it was a win and I'll take it. I meant for the discussion to only be a few minutes, but when it lasted for the period, I was ok with that.